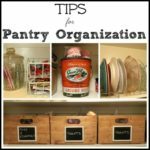 Last week when I shared tips for pantry organization, I showed you the DIY wooden crates that Mr. SP and I made to hold Sherman’s medicines, new toys, and treats on a shelf in our pantry. It’s so nice to now have Sherman’s things contained by these crates and not randomly shoved onto one shelf as they were before. When we got a dog I had no idea that his things would take so much room! 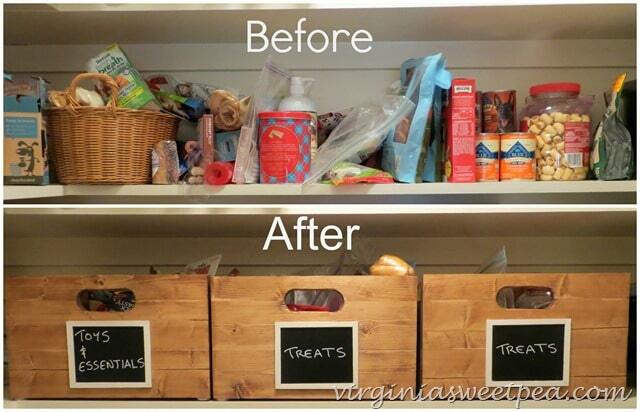 Now my eye goes to human food when I open the pantry door instead of that messy dog shelf. We made these wooden crates to fit our shelves so they are opposite dimensions of a regular crate, the width is longer than the depth. Handles made them easy to slide on and off the shelf. Felt pads on the bottom of the box prevent damage to paint on the shelf. 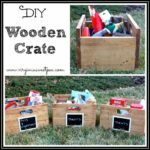 The first step to make our DIY wooden crates was to determine the dimensions of each crate. We designed the crates so that they would be 14 1/2” wide x 12” deep. The front and back sides are 8 3/4” tall and the sides are 7 1/8” inches tall. 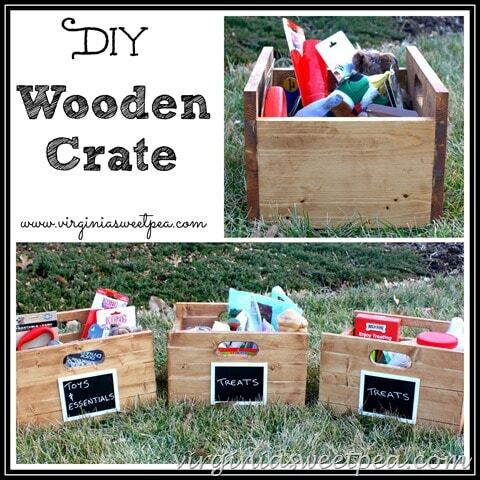 We used 4” (3.5” nominal) wide x 6’ long pine boards from Home Depot to make our crates. We started by cutting 12 (14 1/2”) pieces for the fronts and 12 (10 1/2”) pieces for the sides. The intent was to glue the boards on edge to make a wider board for use (i.e. 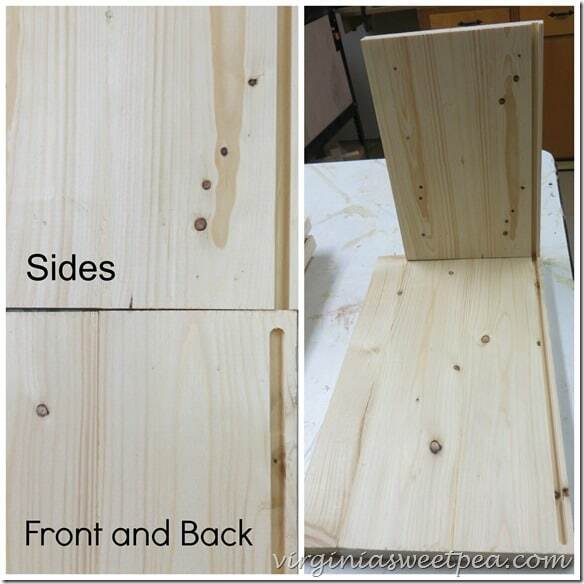 glue 2 boards edge to edge per side). 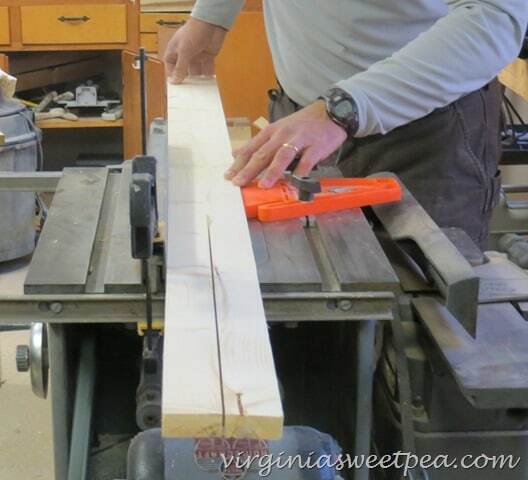 We decided to biscuit the boards together to make the joints stronger, and to align the boards during glue-up. 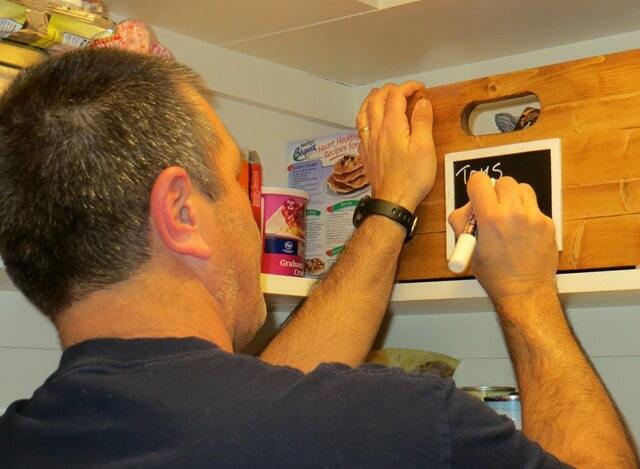 Each pair of boards were lined up, and were marked with a line where each biscuit joint would be cut. The pieces were also marked a,b,c, etc. so that we could easily match them after the biscuit joints were cut. 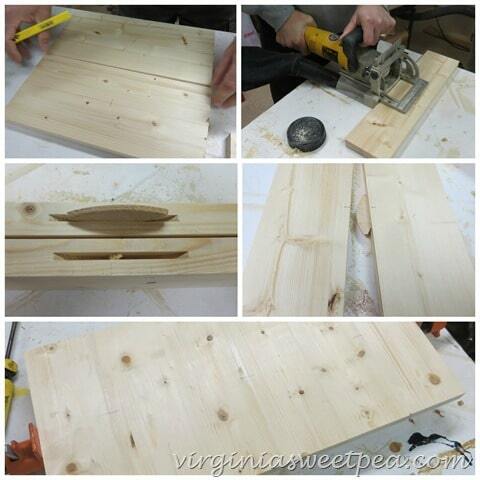 The edge of each board and the biscuit joint were given a coat of glue and pressed together. (Glue not shown in the photograph.) 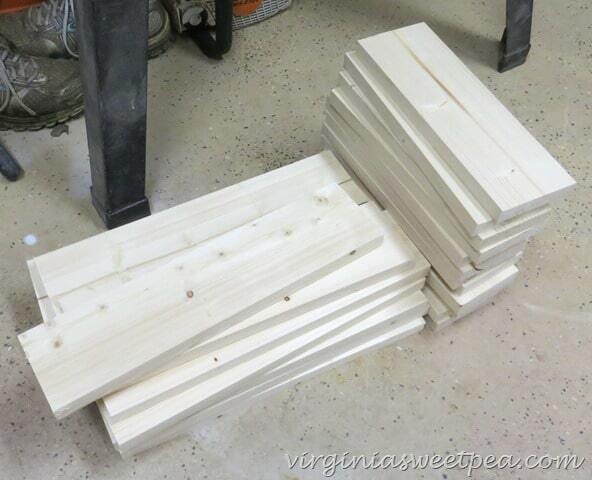 We clamped three sets of sides or ends together at a time until they dried. To make the front and back of the boxes taller than the sides, we used the table saw to rip one of the 4” boards in half. This smaller piece was then cut to match the front width of the boxes (14 1/2” inches) and joined to the other two front pieces with more biscuit joints. We used one on each side of the board since the handle was to be cut in the middle of each front and back. Next we used the router to cut a 1/4” wide, ~3/8” deep channel along the bottom of each side for the bottom to slide into. The bottom of the box was then cut from scrap luan that we had on hand. We cut these slightly larger than the inside dimension of the box so that the bottom would be held within these grooves then the box was assembled. The next step was to make the handles for the front and back of the crates. The handle location was marked and the drill press was used to cut the 2 holes in each opposite ends of each handle with a 2” forstner bit. A sabre saw then was used to cut between each circle. 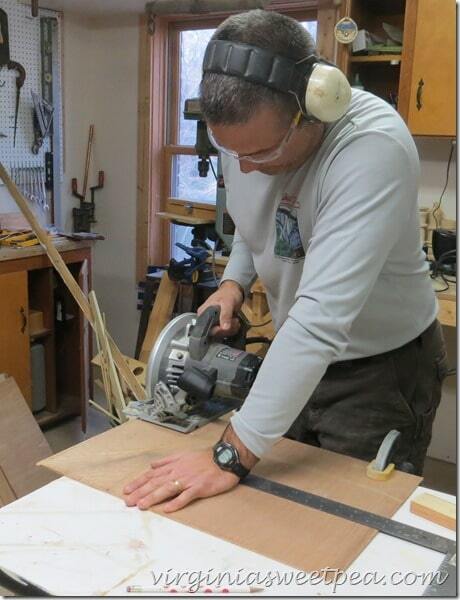 To make the edges smooth, each side of the handle was routed with a 1/4” roundover bit. Note the difference between the routed and unrouted handle. 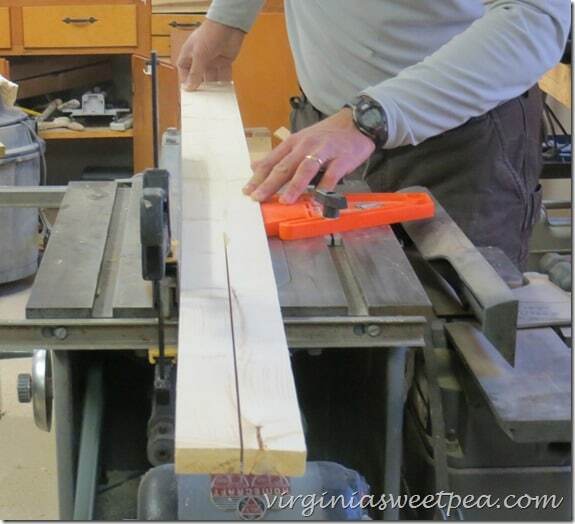 Two biscuit joints were then cut into the edge of each side piece at the corner interface. 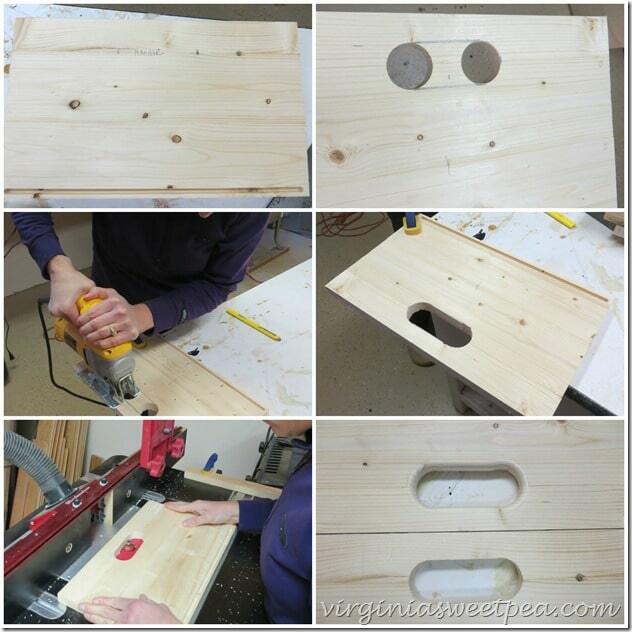 The two sides were glued into place, the bottom was slid into the bottom channel, and then the back was glued on. Clamps made sure that the box stayed square while it dried. After the boxes were dry, they were stained with Minwax Early American stain. Chalkboard labels from Michaels were glued to each crate. 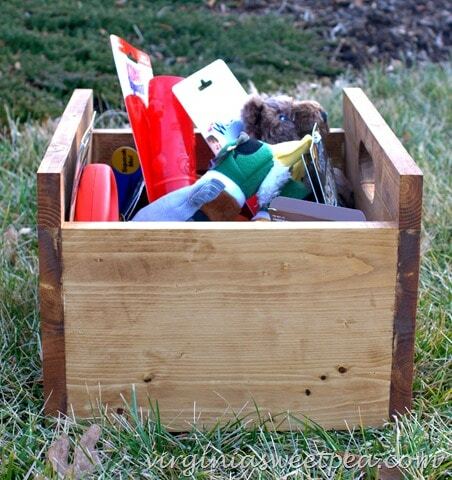 A chalkboard pen from Michaels was used to label each crate. 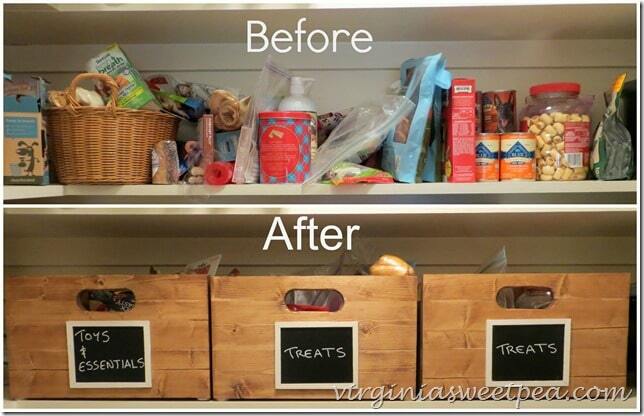 Sherman’s things are now organized in our pantry. These crates would be handy in any room in a house and the handles make them super easy to carry from place to place. 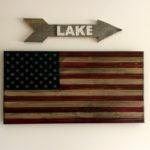 I have a feeling that we just might make a few more of these! 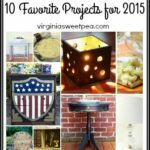 I’d love for you to pin this tutorial to your favorite board on Pinterest for others to discover! Be sure to come back later this week. 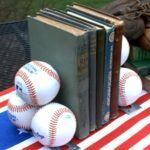 I’m sharing my latest vintage finds and I’ve got some real treasures to show you. 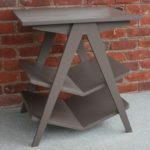 I’m Featured on Remodelaholic Today! You and Mr. SP could definitely make and sell those! Thanks, Lisa. We like to get into the workshop and create something together. Thanks, ladies! 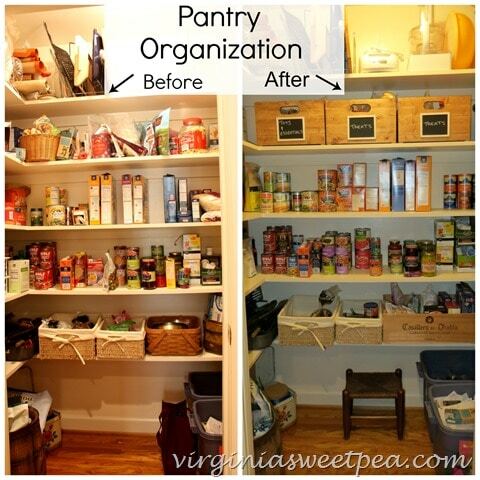 I love my pantry space. It used to be a breakfast nook before we did a kitchen remodel. Thank you, Nadine! 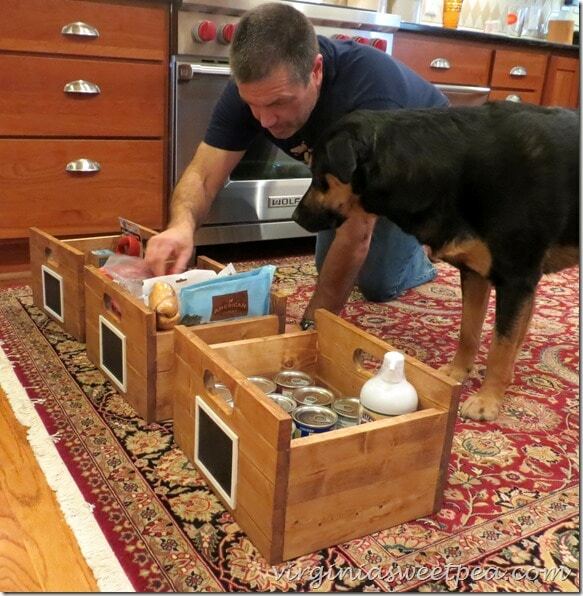 I have a feeling that we will be making more crates for other areas in our home. 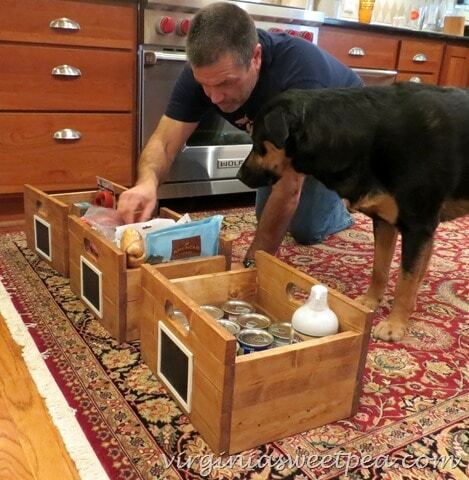 I don’t blame you, if I could make crates like that, I would probably have them all over the house too, lol. Thank you, Kathleen! Poor Sherman went to the vet yesterday for a check-up and is now 85 pounds. I think someone has been given too many treats! Love these! Sharing an pinning girlfriend! WOW! These are great! Thanks for linking up to Tips & Tricks this week. 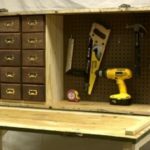 My husband has a woodworking shop in our basement. I will definitely be showing him this post. We may have matching crates soon. 😉 I hope you have a great week! p.s. I pinned this to our Tips & Tricks Pinterest board. Thanks for this DIY. 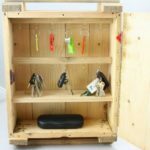 I’m gonna have to make some of these awesome looking crates! 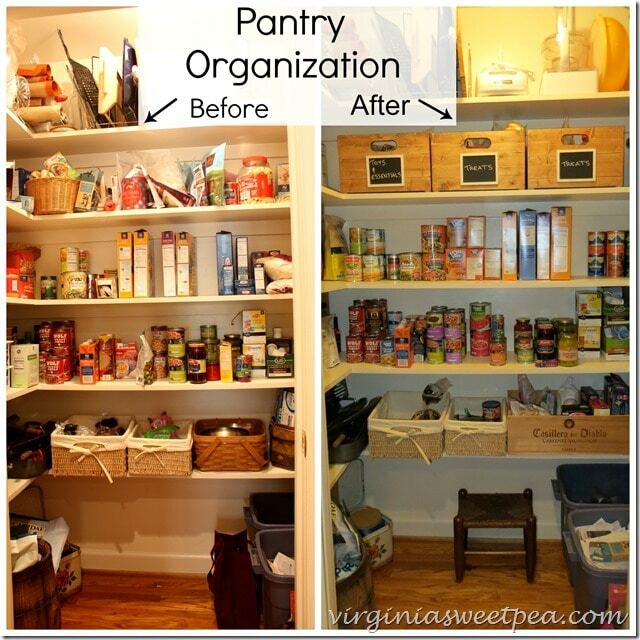 My pantry is in dyer need of reorganization! Paula…such a great project. I had to pin it and share it on fb last week. And I am going to have to make some of my own. I am always so impressed with what you two make! The finished result always looks so professional! I also really want a dog but had no idea they would need three crates of things… 🙂 First I need to move to a place where I can actually have a dog though! They look fantastic Paula and so functional! 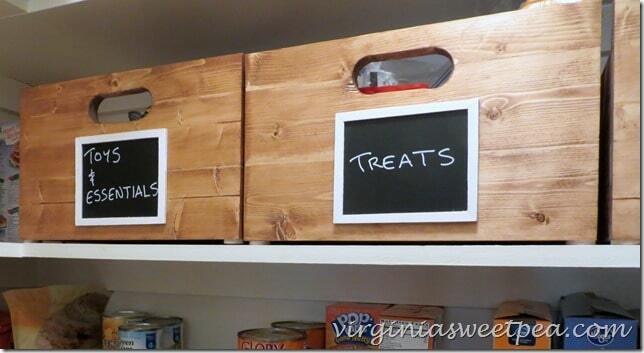 Love the chalkboard fronts, super cute and so easy to update and the contents change…smart! I need some of them, my shelves in the laundry are wide open waiting on a way to organize all my “junk” before I put it back in there. 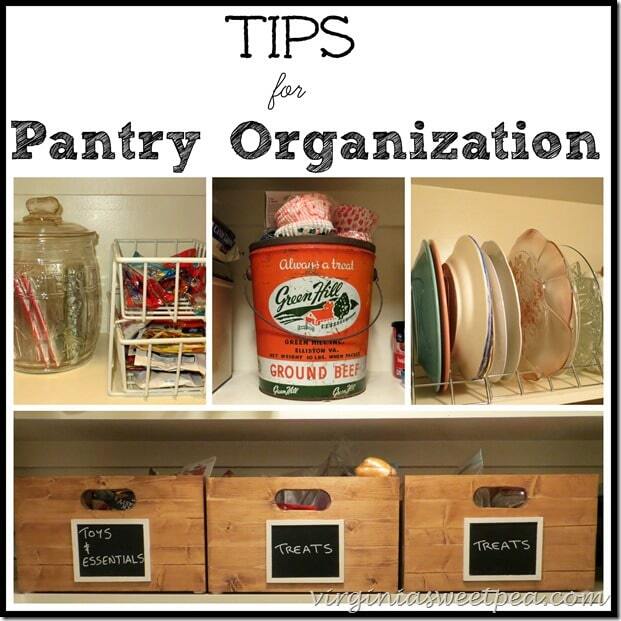 Crates do seem like a great way to organize your pantry. I should put a few of these together. Maybe then I can actually find things. 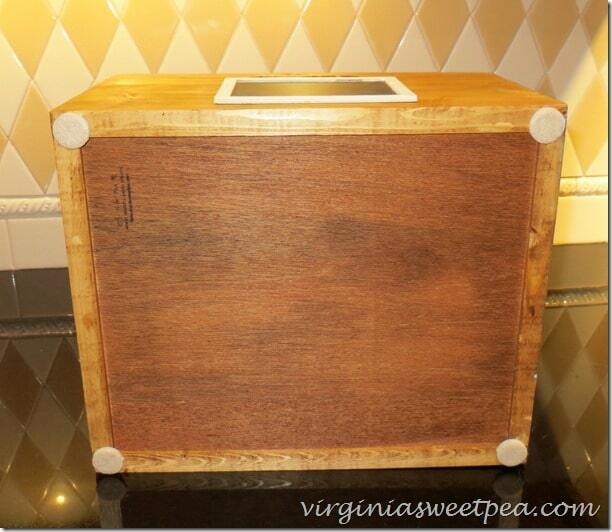 Hi there Paula, I really like the different ideas that you have outlined in your post on the various uses of a wooden box. After seeing them, I really feel that my kitchen could get a better arrangement and some stuffs too should be more organized. 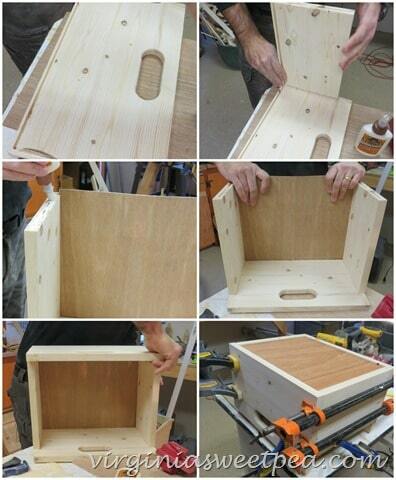 Thanks a lot for the share and on the guide on making the wooden boxes.